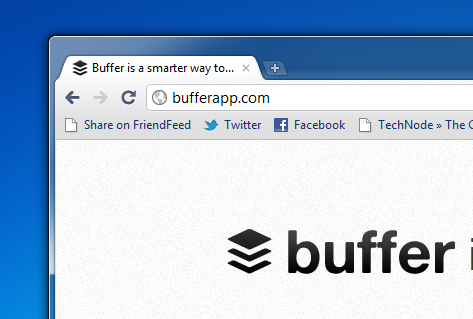 Buffer is a quick no-nonsense web application that lets you designate fixed times for your tweets to go off. When you stumble upon anything interesting during the day, you can fill up your Buffer with tweets and the app schedules them for you. Simply keep Buffer topped up and you will then be tweeting consistently all day round, all week long. Buffer is not by any means a replacement for the Twitter client that you are using but it definitely adds a nifty feature. The key difference with Buffer is that unlike clients like Hootsuite, Tweetdeck or Social Oomph, there is no need to schedule tweets individually. Instead, Buffer lets you set times when your tweets go out, so all you have to worry about is adding tweets to your buffer. The old perception that Twitter is a place to express your daily habits has long faded. Twitter turned into a powerful network, giving you both great conversations and targeted traffic for your site. Managing your time efficiently is key. Buffer helps you to optimize your time on twitter, yet without turning into one of the feared “auto-everything” bots. You start out by setting the times when your tweets go out every day. You can also add your bit.ly details to track clicks and impact. There’s also an option of adding multiple Twitter accounts. Another cool feature of Buffer is that you will be able to collaborate with other members using one (or more) Twitter account. You can have other members Buffer tweets into your list plus you can view a history of tweets posted via Buffer. There are three ways to send in tweets. First is through the web app, second is using a google chrome or safari extension, and third is the universal bookmarklet. With a free account, you can send 3 tweets per day, with a maximum of 10 tweets stacked in your buffer. You can upgrade at any time if you need intend to use it more. It gives you a warning when you reach your limit, or if your buffer is almost full. This is your buffer dashboard. Once your Buffer is topped up with tweets you can always go back here to edit, delete, or rearrange tweets. It’s actually pretty simple– just drag and drop. There is, however, no option to tweet now. What I feel lacking with Buffer is a built-in analytics tool that can give its users an idea which times of the day it would be most optimal to send in tweets based on interactions. The great thing about Buffer is that you can add many tweets at once, without flooding your timeline with Twitter updates. Studies have shown that 58% of people unfollow companies on social networks because “The company over-communicates with me (i.e., too many messages, too much content, it sends spam).” If you’re using your company’s Twitter account, this can actually be a very effective tool to manage tweets. Buffer is an intuitive and useful app but most of the features require a subscription. You can check out the table below for the pricing.